Originally based in the centre of Birmingham from a large main street forecourt where we were established back in 1981. In the millennium we noticed two exciting changes to our industry, with people shopping for their next car from the comfort of their own homes coupled with the huge increase in choice of cars and specifications we have available today. In light of this we made the decision to change our Business model completely to what we operate today. 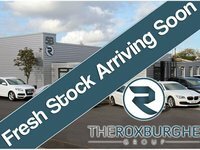 An internet focussed car dealership, specialising in high specification highly sought after vehicles at the sharpest internet prices on the market from our trusted long term suppliers. Although the business model has changed, our customer focussed attitude has not. We are proud to have clients and now friends whom we have supplied cars to 3 generations of their family by consistently providing quality, value and most importantly trust. Best of all, it takes just two minutes to apply for finance online . At The Roxburghe Group, we give you the opportunity to search by the amount you want spend each month. Trade in your old car today!